Eyyyyy CloudySoda bought a custom gem adopt and wanted a Larimar! She’s spunky, fluffy, smol and strong and I love her. Like what you see? Check out my affordable PayPal commissions! Any resemblance to characters of other works by other creators is completely coincidental. 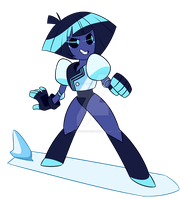 Steven Universe is owned by Cartoon Network and its creator(s), but the character and design of this Larimar now belongs to CloudySoda. The artwork is mine AND hers, so please do not post elsewhere without my permission. Do not trace, reproduce, or steal in any shape or form. If you want something drawn for you, I'm open to commissions, art trades and the like! There really is no reason to steal! thank you you very much!! 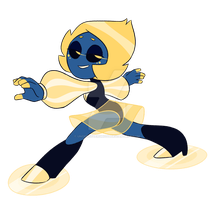 I was considering getting a Star Quartz since she's gonna be the team leader of my gem gang but I figured, like, she's THE gem that makes this all happen, I should create her all by myself! THANK YOOOOU! For real tho, the markings were sooo fun to play around with! SHES A CUTIE FOR SURE!! I’m so glad you like her, she was fun to design! !